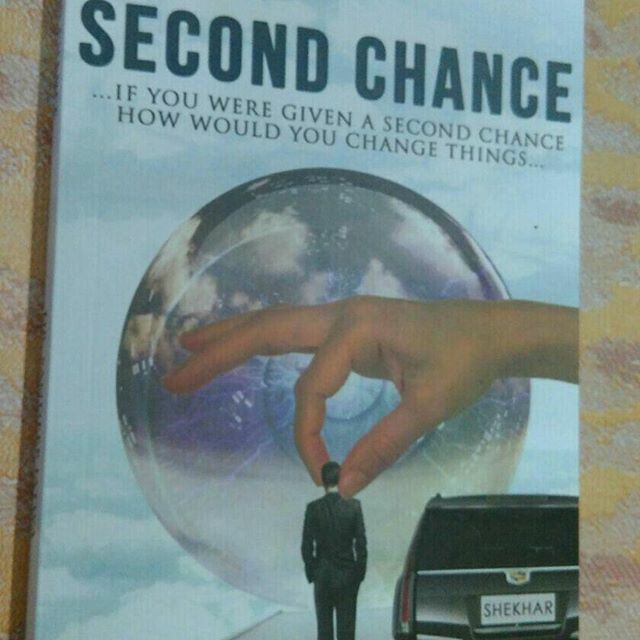 Second Chance is a young age adult novel by Dr. Sandeep Jatwa. The novel is a moralistic story. It laid emphasis on good and bad deeds in human’s life. 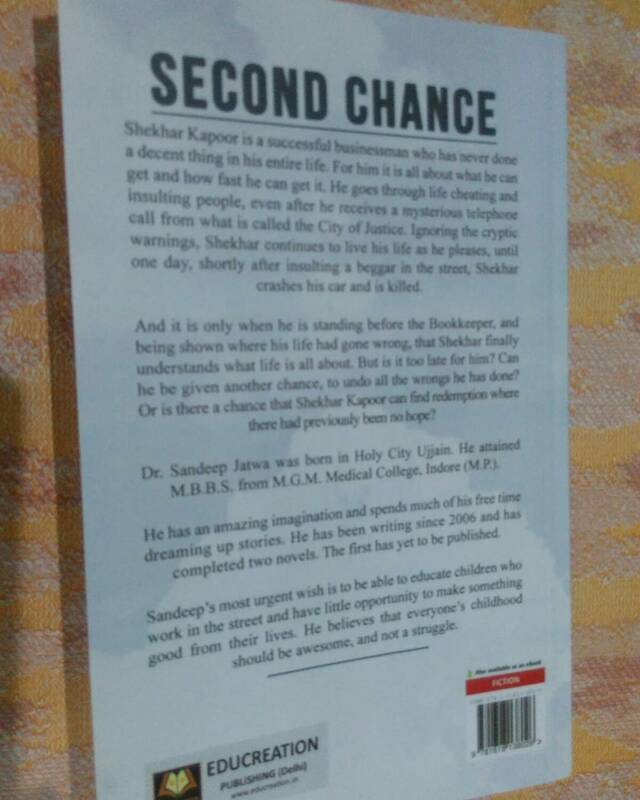 The novel exclaimed that Shekhar Kapoor is a successful businessman, who has never done decent doings in his life. He goes through his life cheating and insulting people. After sometimes, He receives mysterious warnings from the City of Justice to correct his wrongdoings. Suddenly, he realizes about the life after death by his car accident. He understands of wrongdoings in his life. Finally, he has changed totally by second chance in his life. 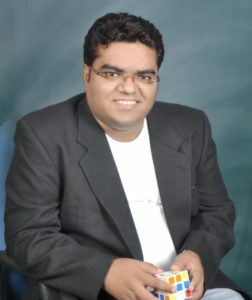 Shekhar Kapoor is a chairman of Aerowalk Company. His father was paralyzed after his mother’s death due to an accident. He hated his father and Kailash Chandra, an old man in his office. He hated his father as he remarks that Shekhar does nothing in his life. He loved kids and animals. The story begins with Shekhar Kapoor as a successful businessman. He is very strict and egoist towards persons. He has done many wrongdoings in his life. Suddenly, he receives warnings for his wrongdoings from the City of Justice. The city of Justice is a mysterious place that records good and bad deeds of the person’s life by the bookkeeper. He has got the first warning through the mysterious phone call on his way to the office. He got a second warning in the form of the envelope of his mischevious things. He promoted person whom he wants or ready to do wrongdoings. He focussed to expand his business not only in India but also in Asia. He receives a final warning through an email that he is self-responsible for his wrongdoing in future. He has purchased Feet land Company, the owner was Ashutosh Upadhaya, by unfair means due to his craze to be a top businessman in the business world magazine. He likes Unnati as one of his employees and wanted to marry her. Suddenly, he had an accident by a rotating Cadillac in the mid-air. He was dead for two minutes in the hospital. Then, he reached to the City of Justice where the dead person got punishment for his bad deeds. He understands his wrongdoings and punishment. He realized that his mother’s love is supreme to remove his wrongdoings and punishment. He opened his eyes after observed hilarious punishments in the hospital. Now, he wanted to correct his mischievous things by his second chance- mother’s love. He has given Kailash Chandra and Unnati their deserved position. He arranged a grand marriage for Kailash’s daughter. Likewise, he returned Ashutosh’s Company to him. He opened an orphanage for needy persons due to the death of street beggar in the hospital. He relieved Unnati from the brain tumor. Meantime, Unnati refused to marry Aditya, her fiance, due to his least concern towards her. Shekhar apologized to his father for his misconduct. Finally, Unnati and Shekhar married after the ups and downs of their life. His life changed as love enters into his heart and life. He was living a wonderful life. The book is a matured novel with moral values. Words has a powerful impact. Love empowers and liberates in every pillars of life. It binds reader till last. It gives an effective impact and outlook towards life. Dr. Sandeep Jatwa works at the Government Hospital. He has an amazing imagination and dreaming up stories. He has been writing since 2006 and has completed two novels. The first has yet to be published. He enjoys new and exciting dishes. He believes that everyone childhood should be awesome. I received review copy from VInfluencers in exchange of honest review. Seems very interesting and fun reading. Like your detailed review on this amazing book. Thanks for sharing your experience.